Alan Rich died April 23, 2010 of natural causes in his sleep at his home in West Los Angeles. “There’s strange and wonderful stuff in this lifetime of Lou’s music,” I wrote in 1987, under the spell of the Cabrillo Festival. “Much of it is so damned beautiful, so open-handed and eager to please.” Just arrived from New York, where open-handed newness was the brand of the musical sissy, I found Lou’s big diatonic C-major symphonies startling at first but for the wrong reasons. I asked him, for a documentary I was producing for KUSC, what were the distinguishing features of a California composer. Lou’s Piano Concerto, out of which Marino and Gustavo whaled the daylights at Disney Hall last week, is strange, wonderful, spellbinding and gorgeous. It has a feel-good slow movement whose pure and simple…well, prettiness, can wash away all your sins. Its finale, which demands a clobbering from the soloist’s fists and forearms that could be considered pretty only by a demonic chorale. Its tuning is the ancient system of “Just Intonation” that Lou sought to revive (along with Esperanto) that maintains a soft and lovely haze between you and the music. It is a very knowing music; it knows about jazz and ancient dances and also about contemporary licks. Those two guys, Marino and Gustavo at Disney Hall, took full possession. It’s nine years – amazing! – since Marino Formenti took his place on our horizon. He came here first with the ensemble Klangforum Wien, which had taken charge of the festival “Resistance Fluctuations.” Dorrance Stalvey, who ran the Monday Evening Concerts, spotted the 34-year-old Marino for his solo potential, and booked him for a recital series that took off like Gangbusters; Formenti has been in orbit ever since. He heads now for San Francisco, to play Messaien’s vast devotional exercise Vingt Régards. Lucky San Francisco. AIMEZ-VOUS BRAHMS? MOI NON, MAIS…. I am not in the habit of linking the lumpy clods that are the music of Johannes Brahms to words like “exquisite,” but hear me out this once. Meandering among the clods of of the Second Symphony at Disney Hall last weekend, in a Berlin Philharmonic performance of uncommon elegance and clarity, my attention was engaged by a sudden burst of music truly exquisite. I love it when The soothing theme that begins the first movement returns, miraculously unscathed after surviving some brutalizing during the development section, its wounds now gently swaddled in remembrances of a somewhat useless, lacey countermelody that had first been, found then lost some time before. It’s actually a familiar Brahms trick, turning the dramatic return of a long-awaited main theme into an angelic, rhapsodic; moment; he pulls he same trick in the B-flat Piano Concerto, but never as purely exquisite as in this Second Symphony, where it comes on as sweet release after entrapment in mud. You go around deploring the overcooked-meat-and-potatoes of those four symphonies, with a special cringe at the gray-wool stuffing of the First, but then there is Papa Brahms, his warm hand raised against the chill that has beset your spinal column that day, and suddenly life isn’t merely okay…it has become, well, exquisite. I did find it curious, however, that time and space were granted, on this al-Brahms program, to Arnold Schoenberg’s orchestration of the Brahms G-minor Piano Quartet — which contains some quite ugly writing for horns and winds that merely falsify the music’s greatly respectable source – as if the world needed a Brahms Fifth Symphony, or the Mona Lisa that beard. Simon Rattle’s Brahms earned him a hero’s cheers, and rightly so. He and his orchestra have grown magnificently. His early days here, as one of two (with Salonen) podium contenders for the L.A. Phil leadership, revealed a revolutionary podium presence, capable of informing the press (meaning me, in this case) that the Phil’s playing was “simply dreadful”and not yet the all-knowing musician he has become. Now he and Esa-Pekka, and a few others, represent a major force to assure the world that symphonies and their orchestras might, after all, endure. That was his major accomplishment in his two programs here, demonstrating with his superlative instrument that this ancient, creaking repertory simply requires wonderfully accurate playing to rekindle that old Brahmsian rapture that used to comfort us at our adolescent bedtimes that all this overscored twaddle somehow stood for authentic music. Later in our lives there would be Mozart. Comes yet another supremely delicious bel-canto comedy from the L.A. Opera’s purveyors of the magic touch, this one the finest of that entire repertory of patter song, giggling ensemble and wonderfully giddy maximum-sense nonsense. There’s something about the magic of this enchanting repertory – a message that has caught hold with this home-town, unpredictable opera company. This time, under sublime. California-perfect skies, Rossini’s tidy, splendidly crafted comedy The Barber of Seville achieves a kind of perfection, galvanized by Nathan Gunn’s great opening “Largo al factotum” held in thrall from then on by the full, cheering house. There was perfection in director Emilio Sagi’s staging, superbly balanced to suggest personal values as well as comedic: the sense of absurdity as well as genuine loss by debuting basso buffo Bruno Pratico as the thwarted suitor Bartolo, the subtle chicanery in Andrea Silvestrelli’s thunderous yet vulnerable Basilio the sly fixer – a stupendous re-creation following last season’s hilarious Gianni Schicchi – the marvelous mix of agile mischief and genuine passion in the Rosina of Joyce DiDonato in her long-overdue debut. As the questing Almaviva another welcome debutor, Peruvian tenorino Juan Diego Flores delivered a show-stopping performance of the opera’s killer final aria “Cessa di piu Resistere” often omitted out of mercy but this time reinstated in full glory. All told, a superb, superbly comic three hours of opera often dealt with as overripe burlesque, here – in the work of debuting conductor Michele Mariotti and director Emilio Sagi – managed with love, respect and an awareness of its antic wealth. HAYDN THE HEAVEN-SENT This is a major anniversary year — for Haydn, Mendelssohn, Lincoln, etc. All are being properly feted, none more lavishly or more deservedly, than Joseph Haydn (born 1809). On my desk sits one of many Haydn celebrations, excellent and lovable: a box containing, 21 Haydn symphonies on 7 CDs. They bear numbers between 41 and 90 and thus represent a “middle” period, just before that final radiance, the dozen-and-more masterworks from the London years that start with the “Oxford” Symphony (No. 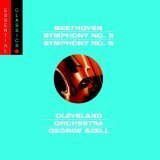 92) and end with the amazing “London” Symphony (104), whose harmonic adventures had portended a new musical language. The performances are led by Bruno Weil, whom you should also know for his leadership of the Carmel Bach Festival. His band is the Toronto-based Tafelmusik, whose crisp, elegant sounds make for some of the most seductive noises on any disc anywhere. I love their vision of the “classical” sound,” crisp. freshly laundered, every color highlighted to evoke your long-held fantasy of the 18th=- century sound ideal. What treasures! Here is a supremely talented composer at the height of his mastery, well-fed at the Esterhàzy table, granted free access to a resident band of the best performers money could buy, empowered to employ that virtuoso band in the invention of new kinds of symphonies, to dream up new structural techniques and sonorities to gain the ear and encouragement of a with-it audience, the kind of crowd we might meet today at, say, the Green Umbrella concerts.. In residence at the Esterházy Palace, or on loan to the assembled connoisseurs at Paris’s Olympic Lodge or at the grand galas bankrolled by the London impresario J. P. Salomon, Haydn flung his marvelously inventive symphonies at an adoring public, with the assurance – seldom granted to any creative artist – that his most daring flights of fancy would be accepted, even admired. I love the mix, of humor and suspense, of the meticulous classical melody and the rudeness of the country dance. 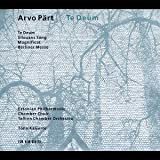 Take, to cite one of many instances) a C-major symphony numbered 90 (in the usual if shakily assembled chronological listing), with its finale a virtual compendium of orchestral tricks. At one point Haydn has his players come to a sudden and prolonged silence in mid-phrase; a few bars later they resume, but in the “wrong” key, D-flat instead of the expected C.—a small distance on the keyboard but a jolt to the flesh! …Or think you do, at any rate. I cling to my memories of a Haydn Symphony course at Harvard, some time around 1942. G. Wallace Woodworth was the spellbinding prof; he also conducted the Glee Club, and “glee” was definitely his word. One thing he most dearly in Haydn was thats gift for surprise. “Woody” – we addressed him in no other way — would start a movement on the phonograph, and a certain point he’d pick up the tone-arm (remember tone-arms?) and, with a smile roughly the breadth of Boston Harbor, would ask the class to stage a kind of forum on what we thought was going to happen next. Then he’d drop the needle, and nine times out of ten we had all guessed wrong. The guys would look shame-faced; the girls would giggle, and Woody and Haydn would have made their point. Sixty years later the memory of Woody’s smile still lights up my Haydn experiences.. Memorable moments abide. I love the way the Symphony 88, familiar from an old Toscanini recording (humorless and harsh of tone) sends a solo flute in delightful skittering counterpoint across some of its tunes, and encourages the kettledrums to make themselves known where least expected, its humor delightfully seconded by Weil and his superb small orchestra. In the Symphony No. 86, which Bruno Walter once recorded eloquently, a slow movement titled “Capriccio” honors its title with unexpected, passionate outcries. The 46th Symphony is in the little-used key of B major – five sharps in the key signature! We know that Haydn’s music in keys with complex key-signatures always affects a particular richness in its harmonies, a leaning toward passion and complexity, and this is the case here — as it is also is in the F-sharp Minor “Farewell” Symphony, one of the few works in this remarkable collection that you may have heard before. His musical trickery is are by turns startling and amusing, but these are only flecks on a surface. Far more important, to these ears anyhow, is the over-all impression you get from these lovely essays, or any gathering of half-hours in Haydn’s blithe company, that here was a composer wise and daring, supremely fortunate (as few in his profession have been) with employment conditions that included his total freedom to experiment with the boundaries of accepted musical structure and style, and to push them back as far as his artistic conscience allowed. Not merely the “Father of the Symphony” of the music-appreciation racketeers (to evoke Virgil Thomson’s precious analogy) he was more the unruly big brother, the family black sheep. Beyond this, it also seems to me that the music room at MEsterház could easily have qualified as as The Green Umbrella of its day. our precious piano pioneer, drew a fine, full house at Zipper, even against the competition of a Murray Perahia recital at Disney across the street. Her concert, the season’s first PianoSpheres enterprise, offered an enticing, imaginative mishmash — handsomely delivered in the blend of eager artistry and flawless technique that are Gloria’s glory: a mist-shrouded piano+tape relic by Luigi Nono, an equally enchanting, fogbound essay by Tom Adès, Alfred Schnittke’s sozzled, gesturesome Piano Quintet (with the excellent Calder Quartet in collaboration), Andrew Waggoner’s sleep-inducing modern take on the ancient dance “La Folie” and, best of all to my taste, John Harbison’s set of “Anagrams” on the name of the PianoSpheres founding saint, Leonard Stein. 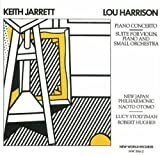 Shorter in length and perhaps more reticent than anything else on this varied, imaginative program, the Harbison was the work that people seemed most eager to praise, out on the sidewalk after the concert. And with good reason. JACARANDA BLOSSOMS: In Santa Monica the season began for this most admirable chamber-music series, and I cannot remember (or even want to remember) a better-imagined, better-played program supercharged ßwith the pleasure of discovery that you could somehow feel and share on either side of the stage. 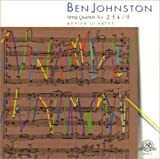 Ben Johnston’s Fourth Quartet has been co-opted by Jacaranda’s Denali Quartet; its brash and aggressive harmonies seem to generate hordes of new friends with every playing. (I heard it first at a private concert, with the 85-year composer in pleased attendance, some months ago. The work is a set of free variations on the old Slavey hymn-tune “Amazing Grace”; and Johnston, music’s great renegade, has made free use of the harmonies of old-time organs and fiddles, as if to return to its own nativity. The Denali has made it their own – progressively so; this was my fourth hearing. The partnership of Jacaranda’s programming genius and the young energy of its performing forces has created an inimitable standard in local music-making. “Programming genius?” Saturday’s concert began with Morty Feldman’s Rothko Chapel,SC10622 his evocation of that haunting Texas artwork for small chorus, drums and an ecstatic solo viola, the work of Feldman’s most easy to describe as “beautiful.”. Then came Ben Johnston’s Fourth Quartet, its radiance intensified by the handsome small church that Jacaranda calls ome. Then – wonder of wonders! !—there came music from that legendary masterwork we all long to have in our midst, Einstein on the Beach: not with Bob Wilson’s magical, madcap sets and staging, but at least with half-an-hour of Philip Glass’s music, B000005J28 enough to intensify our craving for the entire work on a local stage sometime in our lifetime. These were Einstein’s “Knee-Plays,” the interlude pieces that served as flexible joints between episodes. A chorus intoned quick sequences of numbers, which in the original could be seen dancing on a back screen. A solo voice (KUSC’s Gail Eichenthal) intoned the near-jabberwock of an autistic child (the young Christopher Knowles back then, whom Wilson had adopted and groomed into an artistic career). A violinist (Joel Pargman) delivers roulades and cadenzas, symbolic of Einstein’s violinistic skills. If you have evolved a supicion that this doesn’t make sense, you just haven’t discovered the magnificent rationale of Einstein on the Beach. Even unstaged, undanced and unorchestrated, this Einstein teaser — led by Grant Gershon and with the L.A. Children’s Chorus and with Sandra Tsing Loh and Ken Page also among the narrators – makes a convincing case for the whole kaboodle, and sometime soon. So, in fact did this entire superlative concert venture. MANY ROOMS: Actually, the spirit of newness and the joy of exploration filled many rooms these past few weeks. Two of our most imaginative, best-planned, courageous and stimulating concert series – PianoSpheres at Zipper Hall and Jacaranda at Santa Monica’s First Pres — sprang into action in adjacent weeks, both greeted with enthusiasm and delight by properly capacity crowds, Gloria Cheng, our precious piano pioneer, drew a fine, full house at Zipper, even against the competition of a Murray Perahia recital at Disney across the street. Her concert, the season’s first PianoSpheres enterprise, offered an enticing, imaginative mishmash — handsomely delivered in the blend of eager artistry and flawless technique that are Gloria’s glory: a mist-shrouded piano+tape relic by Luigi Nono, an equally enchanting, fogbound essay by Tom Adès, Alfred Schnittke’s sozzled, gesturesome Piano Quintet (with the excellent Calder Quartet in collaboration), Andrew Waggoner’s sleep-inducing modern take on the ancient dance “La Folie” and, best of all to my taste, John Harbison’s set of “Anagrams” on the name of the PianoSpheres founding saint, Leonard Stein. Shorter in length and perhaps more reticent than anything else on this varied, imaginative program, the Harbison was the work that people seemed most eager to praise, out on the sidewalk after the concert. And with good reason. JACARANDA BLOSSOMS: In Santa Monica the season began for this most admirable chamber-music series, and I cannot remember (or even want to remember) a better-imagined, better-played program supercharged with the pleasure of discovery that you could somehow feel and share on either side of the stage. 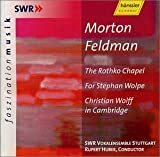 “Programming genius?” Saturday’s concert began with Morty Feldman’s Rothko Chapel,his evocation of that haunting Texas artwork for small chorus, drums and an ecstatic solo viola, the work of Feldman’s most easy to describe as “beautiful.”. Then came Ben Johnston’s Fourth Quartet, its radiance intensified by the handsome small church that Jacaranda calls ome. Then – wonder of wonders! 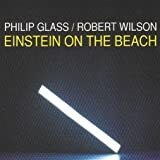 !—there came music from that legendary masterwork we all long to have in our midst, Einstein on the Beach: not with Bob Wilson’s magical, madcap sets and staging, but at least with half-an-hour of Philip Glass’s music, enough to intensify our craving for the entire work on a local stage sometime in our lifetime. Even unstaged, undanced and unorchestrated, this Einstein teaser — led by Mark Alan Hilt and with the L.A. Children’s Chorus and with Sandra Tsing Loh and Ken Page also among the narrators – makes a convincing case for the whole kaboodle, and sometime soon. So, in fact did this entire superlative concert venture. ARRIVALS: My favorite Dudamel moment (so far) occurs during his 2007 performance of Bartók’s Concerto for Orchestra – the performance in Disney Hall, about two years into his romance with the L.A. Philharmonic and which you now can download via iTunes and buy for not very many bucks. 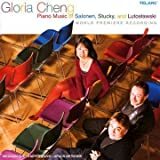 The second movement of that wonderful work is a special delight, a scherzo built out of instruments in pairs exchanging wry jokes with an intervening serious interlude. It’s the music of an elderly but energetic great artist caught in an atypical warm-hearted mood. The young Gustavo had brought the orchestra into this frame of mind; the music fairly gleams with its quotient of captivating ironies. The wit content is high, but so is the tenderness, in these eight-or-so minutes of orchestral magic. Beyond all the acclaim for his daredevil orchestral command – vividly demonstrated to a sold-out, justifiably ecstatic Disney audience at his so-called inaugural last Thursday night, the word turned a little faster one night last week, to honor the occasion of Gustavo Dudamel’s arrival at the Philharmonic podium now officially his. He confirmed that claim in the grand manner: a challenging contrast of a familiar large-scale work and another work of similar scale, not yet known but equipped with convenient handles: a living (respectably) and well-known composer, with a scenario set on familiar nearby streets. Gustav Mahler and John Adams are not everyone’s inevitable choice as program-mates, yet the pairing carried its own message: our orchestra, even in these harassing times, is still dedicated to the responsive listeners’ collective intelligence as well as their tapping toes. Add to this welcome news the tidings that the new leadership has convincingly demonstrated – on this joyous occasion last week, and on the many of similar promise in the past several years – its capability to maintain, and to strengthen, the promises held forward in the previous weeks. We have a marvelous orchestra on our hands, a phenomenal talent on its podium, an audience that, so far at least, simply radiates satisfaction and good will, a quality unique these days in the large concert halls of the world. It is a lovely gesture, and and a not insignificant one, that Gustavo prefers to take his bows in close communion with the orchestra members. “We’re in this together” he seems to say, and there is no better way to shape a great symphony orchestra. Nothing made this any more clear than the concert’s opening: no fanfares, no anthems, no feasting until ‘way later, and a substantial new score by John Adams that, if anything, marks a kind of arrival for the composer as well. City Noir taps into Adams’s long-time adoration for California, a passion we Harvard-bred New Englanders are uniquely qualified to share. His California this time is the land of Raymond Chandler detectives played by Bogart, on dark streets made frantic by Barbara Stanwyck sirens. Its colors are slashing reds and purples of a cluster of tenor saxophones, with the doleful bleat of a trumpet solo to beg for our sympathy. This is not, then, the Adams of political or atomic science as a spectator sport, but rather as a master of the symphonic structure: Naïve. Naïve and Sentimental Music, the Violin Concerto and now this. Those enamored by Adams’s stature as the harbinger of “the new accessibility” may be put off now and then by the direct onslaught of a few pages of City Noir; it is a good, deep, tough work, the arrival into unfamiliar territory by its composer, a step ahead for all of us. Came the Mahler First, and the music for another kind of landscape: vast. serene and sunlit, then triumphantly aflame. 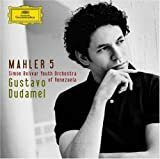 Perhaps there were no real no surprises in Dudamel’s unfolding of Mahler, this garrulous, eager music, unless you count the remarkable rapport that rendered inconsequential any presumed clash of national spirits – Latino v. Wiener in this case. (And also, perhaps. it’s high time to drop that presumption and accept the splendid compatibility, already clearly apparent, between this omnivorous new guy in town and the musical world around him? His radiant Mahler performances hang fiercely aglow in favoring air.. The First Symphony’sdelicious wit, the irresistible bombast, the hundred-percent-pure brass of the ending – these combined for that enchanted evening of our fervent prayers. Yes, it actually happened. Now comes the hard work — for the abundantly able musical forces here at hand as their accomplishments light up our landscape. Maestro Slatkin, may I remind you, is the son of two great Los Angeles musicians, Felix Slatkin and Eleanor Aller, whose Hollywood String Quartet once performed and recorded great, honorable – and uncut – performances. Their CD of Schubert’s C-major Quintet is what I play for friends to demonstrate honest musicianship. Go figure. FOR THOSE WHO CAN’T GET ENOUGH OF ME (Hi, Mom! ): Check out www.bluefat.com. Bluefat is John Payne’s arts Website for which I’m doing some music crit. John was my first editor at LA Weekly, and a strong critical voice in areas I cannot pretend to understand. His new site is attractive, and the ediditing is dpot-on. High over Cahuenga Pass, the fireworks spelled out the evening’s message: “Bienvenido Gustavo!” Others in the Philharmonic’s history among our ten previous music directors – Salonen, Previn, Giulini — had acceded more-or-less quietly to their podiums; not so, our new wonder-kid. The Dudamel era exploded into sight and sound last week in an evening of hoopla at the Hollywood Bowl, with nary a whimper but one helluva bang. Could there be a soul, from the heights of here to the sloughs of Chicago, not touched by the news of Gustavo’s installation, and the bright horizons thereby revealed? The era had begun with a final sop to the cynics: the young maestro, his famous bouncy curls newly shorn, caged — as was the shorn Samson – obviously minutely programmed in the lingo of the press-conference routine, reeling off a routine string of answers: “I love music, I love Los Angeles, Beethoven, y’know, I love my Youth Orchestra, y’know”. At the Bowl the aforementioned YOLA — the Youth Orchestra of L.A. founded under Philharmonic auspices to replicate the legendary Venezuelan curriculum out of which Dudamel had emerged — led off the Bowl festivities with a chunk of the Beethoven Ninth that sounded like – well, like a newly-founded youth orchestra not yet anchored in the niceties of tuning. But this was only a teaser to the evening’s main music. A Dudamel Ninth? The doubters might mumble about sending a boy on a man’s errand; they’d be wrong. This was a splendid performance on its way to greatness, its daunting dimensions intelligently managed. 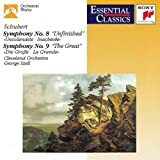 The anger of its beginning – the D-minor uprush that both commands and challenges our attention, emerged from Dudamel’s baton, both beautiful and craggy; the scoring for winds, for clarinets and bassoons throughout this astonishing movement, that is the greatest of Beethovenian sounds, was marvelously dispatched as if by an orchestral master who has lived a lifetime with this sublime music, The fury of the Scherzo, the violence of its thrusts from strings and timpani, were properly agonized. Even more beautiful were the quiet sounds, the texture of the achingly lovely slow movement, a nocturnal rapture under the Hollywood sky. And despite the leveling imposed by the Bowl’s troubled amplification, this performance came across sounding like, well, like Beethoven. So, surprising enough, did the vocal contingent: a picked group from Grant Gershon’s Master Chorale and, among the soloists, a particularly forceful tenor solo by Toby Spence. Between Richard’s Wagner’s Ring des Nibelungen and the Beethoven Ninth there are interesting lines of musical correspondence; it is a measure of our musical growth that both towering works dominate our conversations here in town these days. Just the notion that both artworks begin on their respective stages by emerging from dark musical cloud-banks to an ultimate triumph had a major influence on composers throughout the Romanic era; start your tracing with Anton Bruckner, and keep going. Achim Freyer’s Ring – his rethinking, design and production of Wagner’s immense conception, is now three-quarters complete. Die Götterdämmerung the last of the cycle, rings in in June, 2010, Then the whole kaboodle goes through two complete repeats during that month, while the whole city gorges itself on the schnitzel, strudel and whatever else it takes to affect a “Ring Festival” and “Deutschland über Alles”outlook to make Achim Freyer and his creativie impulses feel at home. What is in Freyer’s stage is important; what isn’t is no less crucial. His work is deeply involving, and we are left free to imagine along with his own imagination. Sleep through a Wagner drama, as some pride themselves on doing, and you have missed several levels of action, of meaning. Of vocal stars there is a paucity, alas: no Flagstad or Nilsson, no Melchior; a Siegfried without a Siegfried. . James Conlon’s splendid orchestra urges the action ever forward, but its urging is lost on Siegfried’s lovers, the up-tight, shrill Brünnhilde of Linda Watson, the drab, unmotivated Siegfried of John Treleaven (the woebegone Tristan of a few months ago). Conlon’s pre-performance talks are a further enhancement at all these performances. Among other redeeming graces, I richly admired the dark eloquence of Vitalij Kowaljow’s Wotan in the three music dramas that are his to ennoble; his long Q&A in Siegfried, with Graham Clark’s delightfully antic Mime, have the best singing in the cycle that I’ve heard so far. Yes, including Plácido’s. A propos Graham Clark: He is also the Mime (pronounced Mee-meh, by the way), no less delightful. 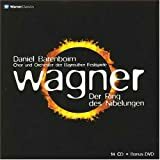 In the Opus Arte DVD of Siegfried, part of a 2004 Ring from Berlin, filmed in Barcelona, directed by Harry Kupfer, conducted by Daniel Barenboim. Treleaven is, once again, the Siegfried, but Deborah Polaski’s Brünnhilde makes partial amends and the Kupfer-Barenboim Ring is wholly girdled by a ring of truth. Dateline Cahuenga Pass, August 30. It was good to be back. A series of small strokes had disarranged the components of my skull for most of the summer. I had missed most of the Hollywood Bowl season and, worse, a most interesting Ojai Festival. Now. Back again on on familiar ground I got to greet old friends –the p-r gals at the Philharmonic (their free tickets!! their press passes!!! ), all the other good souls that make up the eager, bristling, Los Angeles music consumership. What treasures, our Hollywood Bowl, our Philharmonic, our crowd! Ask Your Mama was the Bowl’s seasonal spectacular, the one yearly event planned to fill that geologic Declivity with some kind of music likely to celebrate its own existence, fortissimo, and inundate the bowl-shaped premises with senses-wooing sight and sound. The eponymous Mama, who casts her wisdom over an awareness was the reness of why things in the realm of black-on-white are as rotten as they sometimes can get, strides wisely through a slender and lovable volume of Langston Hughes’ “Moods for Jazz,”: page after page of fleeting compressions of the black-on-white life-lifestyle, many of them haiku-like in length and impact. Laura Karpman composed or – let’s say—synthesized the songs; her Dad Harold is family physician of choice to a broad segment of the local music-supporting crowd, Her contribution is a credible pastiche of blues-tinted numbers stitched into some kind of song-cycle only distantly related to the better-known efforts of Schumann and Brahms. Each song purports to stand in for an expansion on the chosen text-fragment of Langston’s mournful uproar, and allows it to spin free. A gathering of power vocalists had been enlisted at the Bowl to blow her music into Kingdom Come and it fairly well succeeded; it ends up as a journey through some old-timey jazz attitudes, admirably loud and radiating the comforting assurance that you’ve been there before. I missed, however, the bitterness, the seething and the irony that deservedly bear the name of Langston Hughes. The end product, sure enough, may have was the hoped-for roof-raiser. Or close, at any rate. Chief among the noisemakers was one of Nature’s authentic phenomena in the sight and sound of Jessye Norman, whom I honored in bygone decades for her haunting Sieglinde (on RCA’s venerable Ring) and in virtually every nameable corner of the repertory since, an armamentum audible and physical that engulfs your every sense (including a few you never knew you had). A couple of octaves up from her wonder-work, and worthy to share the same stage. . the artfully modulated screech of the stardust-encrusted Dnenna Freelon and the no less sizzling Aadre Aziza achieved a mop-up on whatever senses remained untouched. The pure substance of SONG filled the night-time air, song in its pure if unrefined condition. What I also missed was a sense of modulation, of the variety in a musical progression that makes you curious about what comes next. I missed too the seething, the irony that qualify these songs to bear the name of Langston Hughes. I heard instead a couple of hours’ worth of loud songs of a single fashioning, gorgeously, sung within certain cultural boundaries. For all the skill, including the glistening scoring handily managed by George Manahan leading the Bowl Band, Ms. Karpman’s Mama seemed bent on answering the same question repeatedly over a lengthy stretch of time. Splendid as was the sensibility of the great opera singer – as Jessye. Norman surely are and Mss. Aziza and Freelon on their way– I missed the element crucial to any time-consuming form, any recognizable and credible musical experience: the sense of the right people enlisted to fulfill the most appropriate task in exactly the right place. that, after all, is what words+music aim to accomplish. No fewer than six DVD Don Giovanni’s have arrived here in recent weeks, all of them originally TV broadcasts originating in one or another European house. (The active — and therefore, precious — Naxos Company is thewn distributor of most of these.) If you’ve resisted the idea of experiencing opera via DVD, there’s enough in his pile to challenge that resistence. Now you too can sample this operatic Golden Age that seems to have formed upon Wolfgang’s slender shoulders. Not one challenges the treasurable C D performance infused with the wisdom of Carlo Maria Giulini’s baton. Here’s just the beginnings of a sampling, part of the sustenance I have gleaned over the summer, just from that small pile of Giovannis, Nicolaus Harnoncourt’s version can offer the wounded passion of Cecilia Bartoli’s Elvira, in a Zurich Opera production led by Nicolaus Harnoncourt, with our own Rodney Gilfry as the slender, insidious Don. Come to think of it, the summer’s crop of operatic DVDs has greatly reinforced my faith in the home-TV medium as a worthy representative of the operatic experience. I sat quite spellbound at the reality of Die Walkuere in the Barenboim-conducted Ring as it handsomely spread through my sickroom, with a Siegmund hitherto unkown to me, one, Poul Elming, of thrilling vocal beauty and passion. Under the baton of the great and much-missed Carlos Kleiber there’s a Der Rosenkavalier, its every antic detail lovingly etched. It stands as one Becomes one of my ten-best (or maybe even two-best) opera DVDs ever. Of the best of all operas there is a new and wonderful Barenboim version from Berlin, with Rene Pape’s all-knowing Figaro and the sublime Dorothea Roschmann as his Susanna. Which do I hold among the everbest opera? Surely you don’t need me for that. A Carlos Kleiber Rosenkavalier; a Rene Jacobs Figaro; a Barenboim Ring; throw in a loose-jointed Peter Sellars version of Handel’s Theodora and a Pierre Boulez Pelleas et Melisande; try to sell me that we’re not in some kind of video-centered operatic “Golden Age.” – I am delighted to differ.